Cinema announced itself with a moon shot. 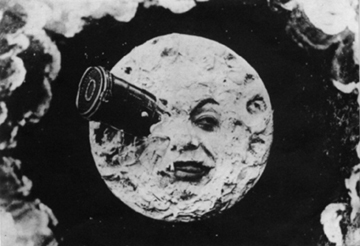 In 1902, Georges Méliès made “Le Voyage dans la lune”, and even today, we remember the image of the man in the moon, squinting; a rocket lodged in his eye. That image has stayed with us for a century. But what will we remember for the next hundred years? What film is enduring enough to be shown in space? In Ben Craig’s short film, “Modern Times”, a future audience watches Charlie Chaplin projected onto a lunar screen. With the anniversaries of Chaplin’s birth and Yuri Gagarin’s first manned space flight, it seems an auspicious time to think about the history of cinema, and its future, out in space. What films do you think will last a hundred years? What movies would you like to see projected on the surface of the moon? We’d like your ideas. You can send us anything, as long as it includes the name of your film: a trailer, a quote, a poster, a photograph. We aim to create a virtual time capsule on Facebook which will hold all the best films. We want to build a cine-library for the next century, filled with movies that mean something to people living here and now. Every week we’ll announce 10 outstanding suggestions. Then, on 17th of April 2012, we’ll close the time capsule, and make a credit list with the names of our chosen contributors. Your ideas will be sealed in our time capsule for eternity…and who knows …maybe we’ll screen your movies in space. This event is created by 10 FILMS and curated by MOVIE WAFFLE. We discover filmmakers and the future of film. Had to go for Flash Gordon… Terribly 80s when watching it now, but such great fun to watch!